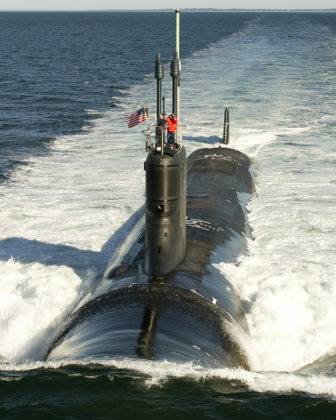 Washington – Even before President Donald Trump assumed office, the Navy had big plans for expansion that included new submarine work for Electric Boat. Now the ramp-up has grown, along with the Groton shipyard’s challenge to find enough skilled workers. EB spokeswoman Elizabeth Power said the shipyard hopes to hire 2,000 new employees this year and already has hired about half of them. Some will replace workers that are retiring or leaving for other reasons. But the company is also preparing for more work – and has already begun planning and design work on the Columbia-class submarine, a huge nuclear ballistic missile sub that would replace aging Ohio-class boats. The Navy plans to begin construction of the first Columbia-class sub in 2021, at a cost of more than $6 billion. In addition, concerns about increased undersea threats from Russia and China, which are increasing their submarine production, has pressed Congress to open the door to three-a-year production of the Virginia-class submarines Electric Boat builds in a partnership with Newport News Shipyards in Virginia. Right now the pace is two a year. Increased submarine production is also part of the Trump administration’s plan for a 355-ship Navy. To prepare for an increase of work, Electric Boat is spending $1.5 billion expanding operations in Groton and at its shipyard in Quonset Point, R.I. But finding enough skilled workers is the ramp-up’s growing pain. EB must assure the Navy it can meet the Pentagon’s increasing demands. “We talk to them all the time about what we need,” said Power. “We talk to them often about potential future needs and how we can respond to them. After the shipyard’s heyday in the 1980s and 1990s, when it produced, on average, four submarines a year, production dropped off and so did employment at EB. So now there’s talk of a “doughnut hole” in the workforce, with many workers in their late 50s and 60s and a growing group of millennial employees, but few workers in their late 30s or 40s. “They are stretched no doubt about it,” said James Hart, president of the Metal Trades Department of the AFL-CIO, the union that covers many EB workers. To Hart, finding enough trained welders and other metal works is a challenge, not a problem. “We always meet our manpower needs,” he said. One way EB could help with its labor shortage, Hart said, is to accelerate its own apprenticeship program. Electric Boat restarted its apprenticeship program in January, in partnership with Three Rivers Community College. There are 30 in the program, six outside machinists, eight inside machinists, five welders, six ship fitters and five sheet metal workers. Next January, another 30 apprentices will start the program. Electric Boat also renewed another dormant apprenticeship program in conjunction with the United Auto Workers in January that also has 30 participants. But it’s training programs outside Electric Boat that may provide more skilled workers. Hill said it hopes to train 450 welders, machinists and other skilled workers in 36 months, most of them for Electric Boat. Hall said manufacturing in Connecticut was “hit particularly hard” by the recession that began in 2008. “But in the midst of these problems, we saw manufacturing coming back – led by Electric Boat,” he said. Since the program began in April of 2016, 172 have graduated and most have been placed in jobs. 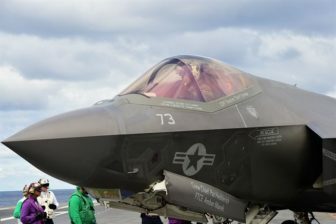 An F-35C, the carrier version of the joint strike fighter, being refueled during sea trials on the USS Dwight D. Eisenhower. EB and other manufacturers have helped create the curriculum for the training program “so there’s confidence that the job seeker who trains in this program will have significant job opportunities,” Hall said. The training is held at Three Rivers Community College, Quinebaug Valley Community College, and technical high schools in the state, including Grasso Tech in Groton and Windham Tech. An initial $250,000 federal grant awarded six years ago allowed the board to create a plan with the state’s community colleges to train workers in advanced manufacturing skills. “This is to help the unemployed, underemployed and veterans,” Hall said. He said when the pipeline first advertised for trainees, 4,000 applied. “If somehow we got more money, we could enroll even more people,” he said. “I think Connecticut got ahead of the curve with these grants,” he said. But the Trump budget for 2018 has sharp cuts to the Labor Department, and that has raised concerns about the future of programs like the pipeline. One obstacle in EB’s hiring is the slow pace of the security clearances the Pentagon demands for those involved in building the nation’s nuclear Navy. Pressed by Courtney and other lawmakers, the Navy assigned 10 reservists to help work through a backlog of security clearances affecting the nation’s industrial base. Still, the clearance process could take up to a year – or more. A boost in commercial and defense work – including increased production of the F-35 fighter jet – also has increased the need for skilled workers at Pratt & Whitney, which builds the engine for the Joint Strike Fighter. The company hopes to hire an additional 25,000 people worldwide in the next decade – about 8,000 in Connecticut—to cope with retirements and a boost in business. High demand for the Geared Turbofan engine used in commercial planes has led to a backlog of more than 8,000 engines, Pratt & Whitney spokeswoman Jenny Dervin said. On the defense side of the business “it’s really the F-35 that’s driving the ramp up,” she said. Unlike EB, which finds many of its workers in Connecticut and other places in New England, Pratt & Whitney casts a wider net. It has partnerships with the University of Hartford and Asnuntuck, Manchester and Middlesex community colleges, but also with schools in Texas, Florida, Maine and Georgia that run training programs with financial help from Pratt & Whitney.